Mohamed Salah has starred this season, but Real Madrid captain Sergio Ramos insisted he did not fear the Liverpool star. LIVERPOOL STAR MO Salah is respected but not feared by Real Madrid, according to captain Sergio Ramos. Salah has led the Premier League giants into the Champions League final and they will face Madrid in Kiev on May 26. The Egypt international has drawn comparisons to one of Ramos’ team-mates, Cristiano Ronaldo, thanks to his impressive 43-goal campaign. But Ramos insisted Salah was just another player, saying there was nothing to be afraid of. While Liverpool’s run to the final has been a surprise, Madrid are in the decider for the fourth time in five seasons. 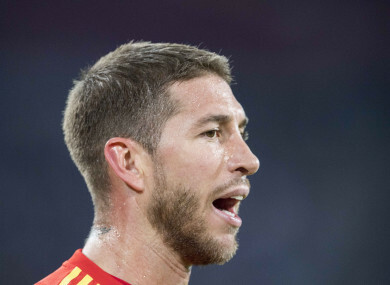 Ramos said his team were desperate to claim the trophy once again against unexpected opponents. “We can’t be arrogant but we can be confident. We know it is in the DNA of Real Madrid to win the Champions League,” he said. “We are ready to defend our title for a second time – we won’t let it go easily. “With all respect, maybe at the start of the campaign Liverpool were not the team people thought would be in the final, but they are here because they deserve to be here. Email “'I have faced the best forward players in the world... For me, there is never a fear'”. Feedback on “'I have faced the best forward players in the world... For me, there is never a fear'”.